SURPRISE, SURPRISE: more units, less parking requested by the Elevator Bay project proponents. Here's a roundup of Elevator Bay-related news. THE BREAKWATER PARK RENAMING PROPOSAL is dead according to a City Staff report. 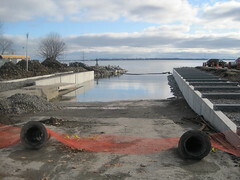 A NICE UPGRADE to the West Street Launch Ramp is presently underway. Click here to see what it looked-like before. THE COMPANIONWAY is the quarterly newsletter of the Kingston Squadron of the Canadian Power and Sail Squadron. The latest issue is online now. The Power Squadron offers a complete range of courses over the winter. There are no downsides to boating-related accreditation, it's all-good. A boating course makes a fine Christmas gift, and it's a nice shared activity. You may be surprised to see the number of boating and waterfront-related advertisers in the newsletter. Times may be tough but, around these parts, local businesses are continuing to step-up in support of the Power Squadron. Part-two of an interesting article about power boat planing hulls by E.B. (Red) Bowes. The first part of the article is here in the August issue. HERE YOU ARE LOOKING southwest from a vantage upstairs at the Radisson Hotel. Click here for a much larger version of this photo. What you see in the middle-distance is the tumble-stone breakwall of Confederation Basin. In the right-foreground is part of the 250 meters of new tumble-stone shoreline around Block-D's Token Park. In the past this 250m of Block-D perimeter was a corrugated metal seawall where boats could tie-up. It was a pretty good place for boat-passenger dropoffs and pickups when the marina's docks were packed in the summertime. It was a fine venue for model-boat racing. It has been said that many late-summer-night skinny-dips took place there in the hours between closing-time and dawn. This was, in short, usable shoreline which is in very short supply around here. But that was then. Let history show that, in the Harvey Rosen era, the City of Kingston transformed this once-usable protected shoreline into severe inaccessible shoreline. Which begs the question: why? All this is on calm waters that are amply protected by the massive Confederation Basin breakwall. This is another waterfront loss in Kingston, one of many that have recently occurred because of the raving lunatics who lead and manage this unfortunate city. Thanks to Joanna Bull for the photo. STICKING-IT to the M.O.E. in the latest Lake Ontario Waterkeeper podcast. It's about the Lafarge case in Bath, Ontario coming to an end. It's a most excellent 26-minute listen. THE BROWN'S BAY INN IS FOR SALE. It's a gem on Wolfe Island, just 4-miles south-east of Confederation Basin by-boat, just east of the winter ferry dock. At the next Council meeting, senior city managers Cynthia Beach and Lanie Hurdle (remember the wonderful, wonderful LVEC project?) want to add $200,000 to the budget for Token Park to cover some glaring planning oversights. Like lighting, and accessibility. To finance this, these people want to filch $55,000 from the city's waterfront improvement account, $55,000 from the cycling and pathway account, and $90,000 remaining in the City Park splash-pad account. Because, you know, we're up-to-our-eyeballs in recreational infrastructure here in Kingston. THE NOVEMBER ISSUE of the Thousand Islands Life e-zine is out. Of particular local interest: Wolfe Island's Lighthouses. The St-Lawrence II is apparently due for NEW LIFE RAFTS. They're reaching-out for funding, in this case via the Aviva Community Fund. The Brigantine always happily accepts donations. TWO WATERFRONT ITEMS on Tuesday's Council agenda. The city wants to renew a 5-year lease with The Crown for POH land and land underwater. The rental rate is ''20% of the marina's annual gross revenue'', or a payment of $75,848 in 2008. Kingston & the lslands Boat Lines Ltd. will keep the Island Queen, Island Belle, and Island Star at POH this winter on account of the Lasalle Causeway lift-bridge being out-of-commission for repairs for the next several months. It looks like a sweetheart deal for KBL. The city is applying the same linear-footage charge they use for non-commerical pleasure boats one-tenth the length of these vessels. Winter storage fees ought to be a function of area occupied, not just nominal length. KBL will be storing its three large wedding-cake vessels for about five-months, through April 30th, for the grand-total of, get this, $4,784 plus hydro for the bubblers. The normal folks paying over $600 in POH winter storage fees for their relatively tiny 30x10-foot sailboats can read that again. When it comes to selling waterfront short, when is the City of Kingston not a pushover?